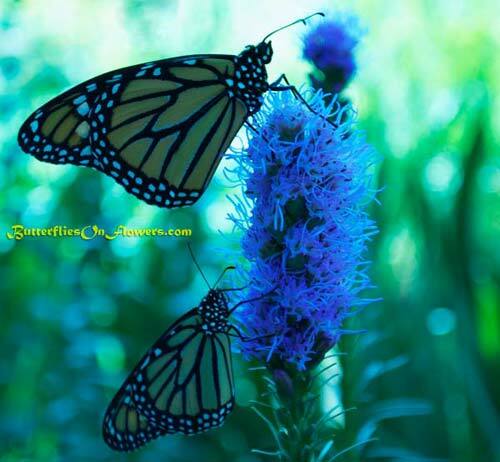 Caption: Two Monarch Butterflies (Danaus Plexippus) hanging on the same side of a Dense Blazing Star (Liatris spicata). This close-winged couple is a male monarch(top) and a female monarch(bottom) that I raised in July of '09. The female was one of the smallest butterflies I have ever raised. She seemed perfectly healthy though and had no problems fluttering into the wild blue yonder. Butterfly Facts: Monarchs have a wingspan between 3 3/8 - 4 7/8 inches (8.6 - 12.4 cm). I suspect the female pictured above may have been smaller than 3 3/8 inches but it's difficult to measure a live butterfly.